Last major update issued on August 25, 2006 at 04:40 UTC. 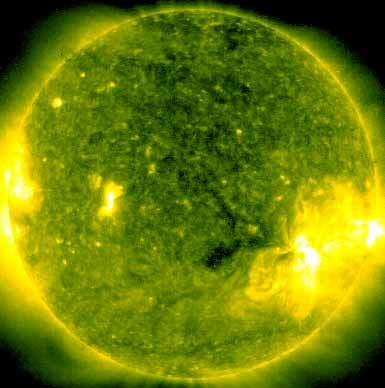 The geomagnetic field was quiet to unsettled on August 24. Solar wind speed ranged between 352 and 446 km/s (all day average 436 km/s - decreasing 36 km/s from the previous day). Solar flux measured at 20h UTC on 2.8 GHz was 78.2. The planetary A index was 5 (STAR Ap - based on the mean of three hour interval ap indices: 5.1). Three hour interval K indices: 31011112 (planetary), 31113312 (Boulder). Region 10905 added some area to the leading penumbra and was mostly quiet. A C flare is possible. August 22-24: No partly or fully Earth directed CMEs were detected in LASCO imagery. A fairly large trans equatorial coronal hole (CH237) will likely rotate into an Earth facing location on August 24-26. 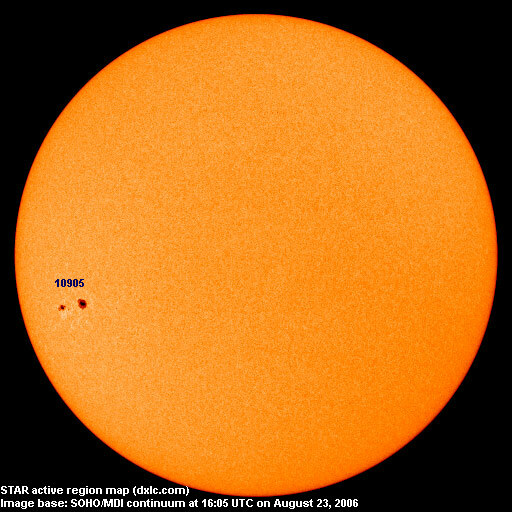 The geomagnetic field is expected to be quiet on August 25-26. Quiet to minor storm conditions are possible on August 27-29 due to effects from CH237. Long distance low and medium frequency (below 2 MHz) propagation along east-west paths over high and upper middle latitudes is poor to fair. Several stations from the easternmost parts of North America were audible with fair signals (examples: The Ottawa stations on 1200 and 1310, 1370 WDEA). Some stations from Venezuela and Colombia (best signal from 1250 Capital Radio) could be heard as well. Propagation on long distance northeast-southwest paths is fair with most of the observed stations from Argentina.